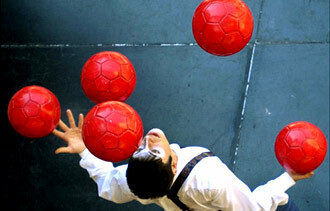 Imagine life as a game in which you are juggling some five balls in the air. You name them – Work – Family –Health – Friends – Spirit, and you’re keeping all of these in the air. You will soon understand that work is a rubber ball. If you drop it, it will bounce back. But the other four balls – family, health, friends and spirit are made of glass. If you drop one of these, they will be irrevocably scuffed, marked, nicked, damaged or even shattered. They will never be the same. You must understand that and strive for balance in your life. Just dropping in from the a to z challenge. Ya life is game i m agree but i m not agree with the all examples.About work,health and spirit i m agree but about family and frnd these two gifts of god is not like a glass ball .I'll only say last two fill us with spirit to take care of our health and to finish our work .how is it?